PNG is an image format which has been supported since 1997 by browsers from Netscape and Microsoft. It is a standard supported by the World Wide Web Consortium. A lossless format like GIF, but it compresses the picture better and supports full color imagery (up to 48 bits per pixel!). 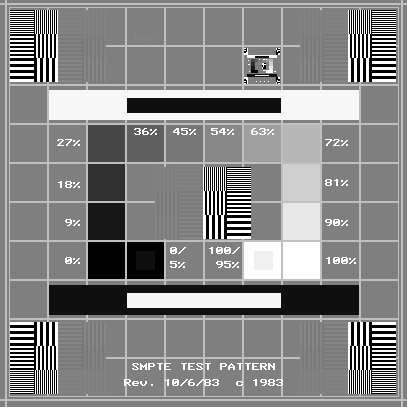 The picture below is an RP-133 conformant SMPTE (Society of Motion Picture and Television Engineers) video test pattern. If you click on it, you will be brought to a small gallery of great PNG images. For (many of) those looking for a free way to look at PNG images now, I discovered a really nice freeware utility called IrfanView. It is available from Irfan Skiljan. It is a Microsoft Windows application which supports a wide variety of graphic formats. Conversion between the formats is easy, and it has a large selection of image filters and other effects.